After arriving in Calgary, you pick up your car and depart the city and set your sights today on the magnificent Rocky Mountains. Experience the majesty of the mountains as you first travel through the foothills and then enter Banff National Park where the lofty peaks form a picturesque crown around the parklands. After you have arrived in the bustling town of Banff, the remainder of the day is free to explore its many dining and shopping venues. Overnight at Hotel in Banff. Banff National Park is a stunning wilderness and your outdoor playground for the day. A highlight of your day will be a ride on the Banff Gondola as it ascends to the pinnacle of Sulphur Mountain for an awe-inspiring 360- degree panorama of sheer mountain majesty. Enjoy the interpretative hiking trails that lead along the ridge of the mountain. After an invigorating hike, perhaps enjoy one of the two excellent restaurants at the summit. Overnight at Hotel in Banff. Today you will be driving through the Bow Valley to get to beautiful Lake Louise. This glacier-fed body is the acclaimed “Jewel of the Rockies”, said to be Canada’s most photographed lake. With the Victoria Glacier in the background, this emerald-coloured lake is sure to leave an indelible impression. Admire the stunning vista from inside the Fairmont Chateau Lake Louise standing atop a giant glacial moraine formed after the last ice age. Across the valley from Lake Louise Village, you can take a chairlift up Whitehorn Mountain for even more dramatic views of this pristine area. Overnight at Hotel in Lake Louise. Today you depart for Jasper via the spectacular Icefields Parkway - one of the most scenic routes in the Canadian Rockies. We suggest a stop at Peyto Lake and a visit to Maligne Canyon in Jasper National Park to experience the quiet trails and forests first hand. At the Columbia Icefield, you board the specially designed Ice Explorer for a journey on to the massive Athabasca Glacier and experience the thrill of walking on centuries-old glacial ice. After this exciting experience, continue on to arrive at the resort town of Jasper. Overnight at Hotel in Jasper. Today is at your leisure to explore the uniquely beautiful landscape of Jasper National Park where serene lakes and gentle meadows stand in stark contrast to jagged peaks and spectacular glaciers. We suggest a Maligne Lake boat cruise, a visit to Miette Hot Springs, or a ride on the Jasper Tramway. Perhaps enjoy a quiet meal for your final night in Jasper. Overnight at Hotel in Jasper. Today you spend the day on a full-day tour along the scenic Sea-to-Sky Highway to the world famous ski resort of Whistler. Along the way you’ll make a stop at Shannon Falls, cascading over 300 metres above frothy pools and set in a tranquil provincial park. Upon arrival at Whistler Village, the pedestrian squares and laneways offer a magnificent view of forested slopes and misty peaks in the distance. The rest of the day is free to explore this idyllic resort town with its many shopping, dining and recreational activities before returning to Vancouver. Overnight at Hotel in Vancouver. Return to Vancouver International Airport in time to check-in for your return flight. 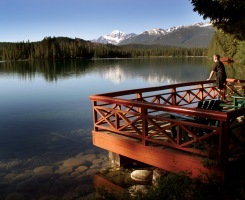 •	Accommodation for 7 nights in Hotel (Banff 2 nights, Lake Louise 1 night, Jasper 2 nights, Vancouver 2 nights). •	Accommodation for 1 night on board VIA Rail's The Canadian including 1 breakfast & 1 dinner on board. •	Ice Explorer on the Athabasca Glacier. •	Banff Gondola ride. •	10-hour Whistler resort tour including Shannon Falls. 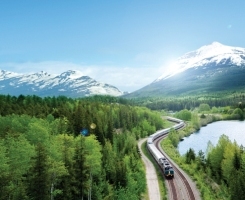 •	Overnight train from Jasper to Vancouver on The Canadian (section accommodation). •	Mid-sized car (Class C) rental from Day 1 to 6, taxes and insurance. •	International airfare •	Airport Transfers •	Optional tours/activity •	Visa charges •	Travel insurance •	Tips and portage •	Expenses of personal nature •	Services not part of inclusion list •	Meals and attractions unless otherwise specified. •	Car drop off fee in Jasper of approximately $290 payable locally.